Helpful Tips: Defrosting Your Windshield – The Insurance Buzz! Have you ever been running late, racing out the door, only to see your car and realize your windshield is covered in ice? Or, have you ever seen someone driving down the road with one tiny little spot of their windshield scraped, blinded by the ice? That is easily one of the most dangerous things you can do, putting yourself and everyone else on the road in danger. During the winter months, we have to make sure we heat our cars up twenty minutes ahead of time, or longer if the roads are still covered in ice. 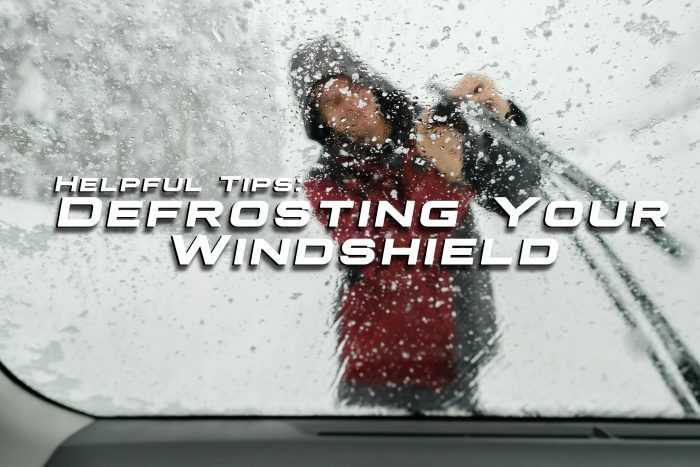 Here are some tips to defrost your windshield effectively in the cold weather. Defrost your windshield without doing any work or using any tools by using the defrost setting on your car’s heater. This will take up to twenty minutes. Turning on your wipers can help speed up the process. Be sure you keep a scraper in your car wherever you go. If you don’t already have one, these can be purchased at gas stations and hardware or auto stores. There are a variety of different kinds–with varying handle lengths and different features to help you get the job done more quickly and more efficiently. Remember to never, ever use hot water as it can crack your windshield. Using cold water can make matters worse depending on the climate. You can mix commercial salt and water in a spray bottle and spray your windshield. However, do not apply too much to your windshield to prevent damage. A rubbing alcohol and water solution can also be applied. There are also some de-icing sprays that can be found at your local hardware or auto store. Ice prevention sprays can be sprayed on the night before that will help reduce the amount of ice build-up on your car overnight. Keep in mind that “puffing” is illegal. Puffing is warming up your car, with the keys in the ignition, unattended. You legally cannot start your car, walk away, and let it sit there warming up. If you have a Push-to-Start car, this does not apply to you. Leaving your keys in the ignition is practically Christmas for a thief. Do not puff. Please never drive until your windshield is completely defrosted. Keep your safety in mind. Be prepared when cold weather comes.